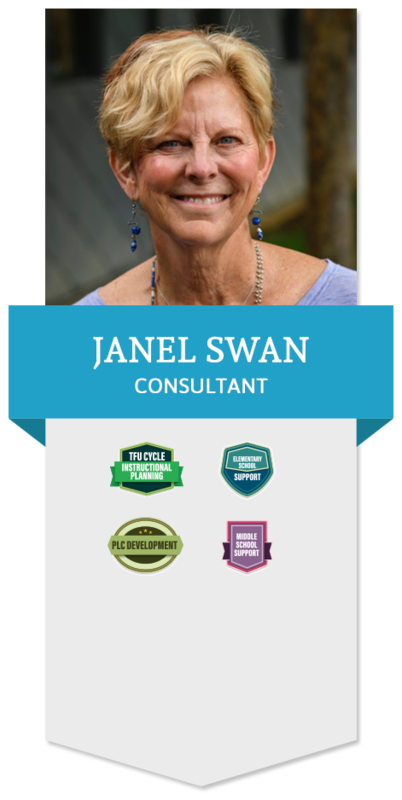 Janet Swan currently serves on the executive committee of the Board of Directors for the Texas Staff Development Council. Janet has provided training on Tips, Tools and Techniques for Facilitation (TTT) and Leadership Development Program (LDP) across Texas in both Service Centers and school districts. As a benefit of working in professional development, Janet is a trainer not only in TTT and LDP, but also in cooperative learning, Thinking Maps, mentor training, first year teachers academy, Ruby Payne’s Framework for Working with Students in Poverty and QUILT (Questioning for Understanding to Improve Learning and Thinking). She has also participated in training with Eric Jensen and Rich Allen on brain-based learning. Janet has worked with campuses in California and Oregon to help raise student achievement scores and implement small learning communities. In addition, she has expertise in facilitating strategic planning. Janet retired from public education after 34 years at the junior high, high school, and administration levels where she taught math and computer science and served in administrative positions including Assistant Principal and Coordinator of Professional Development. Janet was awarded Teacher of the Year in her district and completed her career in public education at Keller Independent School District as the Director of Professional Development. © Copyright American Alliance for Innovative Systems, LLC. AAIS is a team of skilled educators who provide quality personalized technical assistance for educational systems so they are poised to become highly functioning 21st century centers of learning for all students.